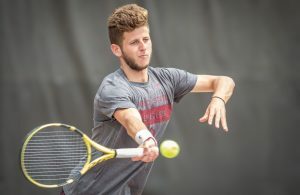 Spring practice is over for Florida State and the time is now to start counting down the days until Sept. 2 when the Seminoles head to Atlanta to take on perennial powerhouse, Alabama. 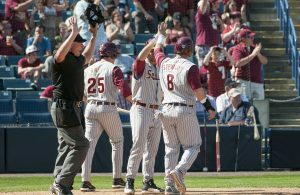 While the annual spring game held Saturday is not an end-all, be-all for what will take place in 2017, there are some observations that could be made from the Gold’s 17-7 victory over the Garnet. Mike: For me, the biggest surprise on Saturday was senior cornerback Malique Jackson. With Tarvarus McFadden and Marcus Lewis out, Jackson looked like a player who wanted to be on the field in 2017 after playing sparingly over his first three seasons. Maligned tackle Brock Ruble also had a good day in pass protection on an afternoon where that was a sore spot for the offensive line as a whole. Defensive tackle Darvin Taylor also looked like a contributor for 2017. Clint: I’ll say Da’Vante Phillips surprised by showing off his potential at being a legitimate threat for the receiving corps. He’s got legitimate speed and burst off the line, so if he gets the playbook down, he could be in for a surprise year. Jay: Malique Jackson was the biggest surprise on Saturday. Jackson blanketed wide receivers early and got his hands on a number of passes. A senior for 2017, some had written Jackson off as a candidate for attrition, but he showed on Saturday that he won’t be going quietly. Jared Jackson, a walk-on wide receiver, is a guy that I feel like is a scholarship player. He showed that with 51 yards receiving to lead the Gold team. 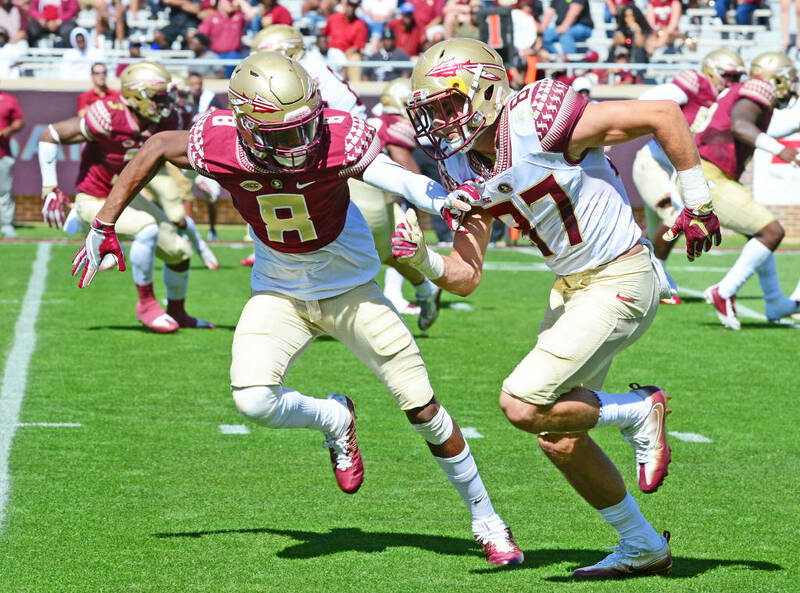 Mike: Some of this may be due to the defensive line and secondary playing so well, but I was hoping some of Florida State’s young linebackers would stand out. Adonis Thomas was active, but I was expecting someone like Sh’Mar Kilby-Lane, Emmett Rice, Dontavious Jackson or Delvin Purifoy to separate himself from the others, but that didn’t seem to happen. The one young linebacker who was impressive was Josh Brown, but that was mostly from the “BUCK” position. Clint: Deondre Francois hasn’t seemed to progress all that much from last year. That might not be unexpected, considering it’s only been a few months since the end of the season, but improving his accuracy would help the offense immensely. He needs to improve or else the offense will not reach its ceiling. Jay: Although he is coming off a late-season foot injury, Ermon Lane didn’t seem to make much of an impact at safety. Lane looked like a natural last season upon moving from receiver, but for a secondary that had a really good day, Lane was noticeably unspectacular. There weren’t many negatives. Deondre Francois could have been more accurate. Who is the Verdict Still Out On? Mike: For me, the answer here is clearly Bailey Hockman. The early enrollee went just 3-for-11 passing on Saturday, but had virtually no time to pass or anything resembling a clean pocket to throw from. I was curious to see if Hockman was able to oust J.J. Cosentino for the job of backup quarterback. That question remains unanswered. Clint: Jacques Patrick. Patrick showed quicker feet and more willingness to bounce outside than previous glimpses, but Cam Akers is right on his heels. It remains to be seen how he’s going to be used this year and if he will even start at the beginning of the season. Jay: Levonta Taylor was used sparingly on Saturday, which didn’t tell us much. Taylor, a former 5-star recruit, is expected to start either at field cornerback or “STAR”, but seeing so little of him on Saturday makes it hard to project the progress he has made. Taylor played well last season, but was limited by a deep thigh bruise. Mike Ferguson is the editor of The Daily Nole and former editor of Noled Out. Mike has more than seven years experience as a sports writer including the last four in print and online media. Mike graduated from Florida State University in 2009 with a Bachelors in Religion and a minor in Communications. 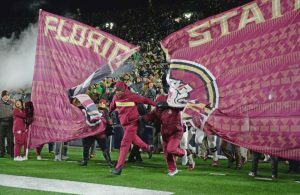 Mike provided press coverage of Florida State's run to the 2013 BCS National Championship. Mike is also a news reporter at Polk County's newspaper, The Ledger in Lakeland, Florida. and contributes to Athlon Sports and ACCSports.com. Mike has been featured on sites as prominent as Yahoo Sports, FoxSports.com, Associated Press and the front page of SI.com while interviewing athletes as high profile as 2013 National League MVP, Andrew McCutchen. Email Mike at Mike@TheDailyNole.com. Follow Mike on Twitter @MikeWFerguson. Copyright Â© 2014 www.TheDailyNole.com - All Rights Reserved. This website is an independently operated source of news and information not affiliated with any school or team.